In recent years, there has been increasing emphasis on the diagnosis and treatment of syndesmotic injuries. Injury recognition is crucial, especially in athletes where it has been shown to be associated with long-term ankle dysfunction, missed time from sports, and the need for operative stabilization. However, the physical and radiographic examinations can be deceiving, and accurate diagnosis can be difficult despite improved diagnostic modalities. Additionally, there is controversy regarding criteria for operative intervention and, when indicated, which implants are optimal. This chapter’s objective is to present an evidence-based review of the current best practice of syndesmosis injuries in sports. Thormeyer JR, Leonard JP, Hutchinson M. Syndesmotic injuries in athletes. In: Zaslav KR, editor. An international perspective on topics in sports medicine and sports injury: InTech; 2012. isbn:978-953-51-0005-8. 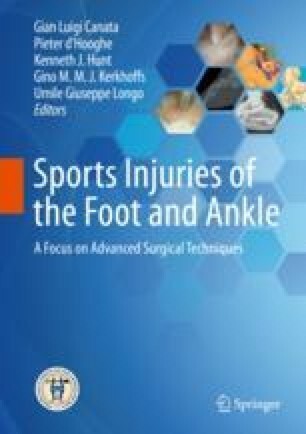 Available from http://www.intechopen.com/books/an-international-perspectiveon-topics-in-sports-medicine-and-sports-injury/syndesmotic-injuries-in-athletes.